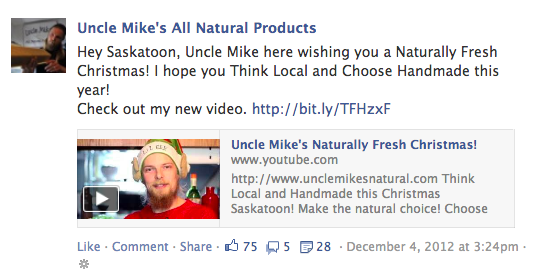 Uncle Mike’s All Natural Products is a Saskatoon based producer of hand-made soap and body products. Started in 2010 by local wall-climber Mike Zimmer, the initial intention was to make natural based products for himself and his family. With a little more experimentation, he had developed a small batch of products that he started selling in 2010. After receiving positive feedback from strangers at the Saskatoon Fringe festival, we started talking about potential to keep growing. With a limited a budget (as most start-up businesses face), the internet was going to be the foundation for growth. Fast forward a couple years and Mike is now doing Uncle Mike’s full-time (aside from being a stay-at-home dad). 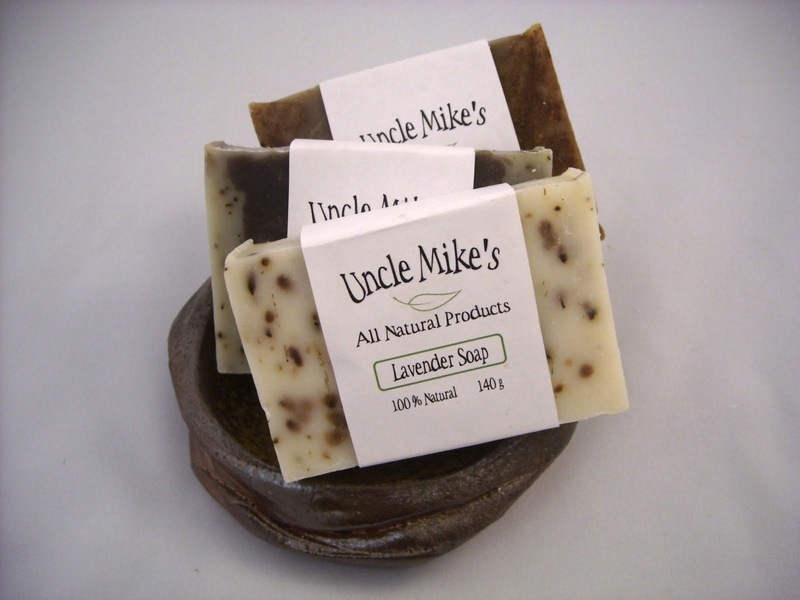 Becoming a mainstay at the Saskatoon Farmer’s Market 2013 is set to be a great year for Uncle Mike’s All Natural Products. So what did we do to help get him to this point ? We wanted a goal to drive all online efforts. Mike’s was to grow sales to support a healthy income to support his family AND educate customers against the chemicals in cheap mass-produced body products. He doesn’t need or want to get ultra rich off Uncle Mike’s , but if he could make $50,000-$80,000/year – he would be more than happy. Mike is a funny guy. We wanted to capture that on video and get people familiar with the friendly face behind the products. We wanted people to start doing the double-take if they saw him walking on the street. “Hey, is that the soap guy I keep seeing on Facebook? ?” The products are great, but people need to buy “him” first. The more we can convey he’s a great guy that makes great natural products, the better for trust and sales. Even though there may be potential to expand outside the city/province in the future, we wanted to focus on Saskatoon and grow a really strong presence and customer base here. Mike is also an avid fan of buying local goods himself, so concentrating on Saskatoon as his main market makes sense. We wanted video to be the driving force of all marketing as it allows people to see and hear Mike online. Each time a video was posted on to Facebook, his traffic and likes would get an instant spike. The regular videos add to the facial and name recognition we wanted to achieve. The goal with this initial video was to introduce Mike to Saskatoon and offer a coupon code to see how effective it could be. 6 people ended up using the coupon, but not bad for his first video effort to create online sales. This one was designed for his 2012 fringe appearance where he went from a busking spot to a full on tent spot. We wanted to get some laughs but also remind people to come visit him during the Fringe. The latest video was released in early December to remind people to think of Uncle Mike for Christmas. It has also been the most successful video in terms of ROI on sales. That being said, it was Christmas and people were ready to buy. Getting a video up is half the battle. You need eyeballs on your video for it to have any impact. For each of Uncle Mike’s videos, we had a small budget to work with in terms of advertising. We focused on Facebook because of relatively low cost and high reach. As you can see, different videos and spends had different results. We’re going to continue to develop his presence online and eventually reach his goal. By the end of 2013, we want him to be a recognizable face to a large segment of Saskatoon and get closer to his income goal.